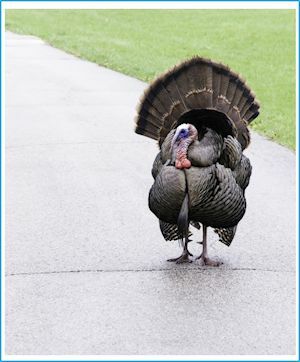 The Washington Post recently published a story on common myths about turkeys. For example, Ben Franklin did not seriously propose the turkey as the national bird in place of the bald eagle–at least not in the way most people assume. You can read more about that and other turkey myths here. We at Learning Stream are all about dispelling myths, too. For example, there’s the one about how you must be a computer expert to use robust registration management software. But we’ll leave that discussion for another time. For now, we’ll help dispel a few more myths about turkeys and Thanksgiving. Myth: There is no good Thanksgiving song. Really? Then what’s this song about mashed potatoes by James Brown? And if that’s not good enough, we nominate this one about fried neckbones and home fries by Willie Bobo. If you think fried neckbones aren’t Thanksgiving fare, when was the last time you ate roasted chestnuts at Christmas? Myth: The turkey got its name by acting a like a jerk. The large American fowl that ends up on many Thanksgiving dinner plates got its name from the country that straddles Europe and Asia. Back in the long-ago, people used to name some products after the place of their assumed origin. Turkish merchants sold guineafowl. Therefore, their customers often called guineafowl turkeys because they assumed that was where the bird came from. When early settlers first saw the turkey in America, they thought they were guineafowl, which they called turkeys. They were wrong but try to tell that to a pilgrim. Imagine how turkeys could have received a much cooler name, like Wesley Wattle. Myth: Speaking of pilgrims… That’s not what the settlers at the first Thanksgiving were called, unless Stanley and Louise Pilgrim, previously of Portwinkle, England, were among them. They called themselves Saints. Some of them settled in New Orleans. Myth: Thanksgiving is uniquely a U.S. holiday. Canada is no Johnny-come-lately, celebrating Thanksgiving officially for 139 years. The Canadian version is celebrated in October. But they “celebrate” Black Friday the same day as their southern neighbors. Myth: Speaking of Black Friday, the origin of the name refers to the day when retailers finally start to turn a profit for the year. (Red ink for losses; black ink for profits in old accounting ledgers.) The phrase was coined in Philadelphia about sixty years ago, and not as a positive occurrence. It referred to traffic jams and long shopping lines that people endured each Friday following Thanksgiving. There are lots more Thanksgiving myths we don’t know about. If you would like to share a few, or reach out to us about class registration software, please contact us.